I’ve probably bored people to tears with my moans and gripes with the excessive number of superhero movies we’re being treated to year on year, with some of the recent Marvel films starting to strain under the weight of characters and the service to an overarching plot, which in many cases will not have any pay off for several movies time. I include the ‘Guardians’ films in this, where I feel I’m not enjoying the films to the same degree as many others, so I was pleasantly surprised at just how much fun I had with ‘Thor: Ragnarok’, a bombastic space opera that gets the balance of humour just right and makes the most of the MCU’s most consistently entertaining character and best performer in Chris Hemsworth’s ‘Thor’. Following on from the disappointment that was ‘The Dark World’, ‘Ragnarok’ makes the wise decision to spend almost all of its time in Asgard and the neighbouring realms instead of earth and it provides a focus to the story that somehow feels tighter and looser at the same time. It’s still a high stakes and high concept plot, with the premise of ‘Ragnarok’ surrounding a prophecy that will see Asgard destroyed by a demon known as Surtur. 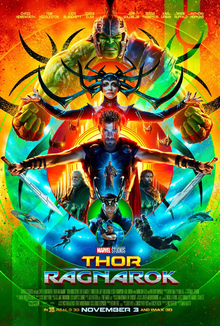 This takes Thor back into Asgard where the familial squabbles with brother Loki (who Tom Hiddleston once again manages to play as successfully toeing the line between good and evil) are enhanced by the arrival of their older sister Hela (Cate Blanchett), known as the goddess of death. This is all high camp stuff but fortunately the responsibility for ‘Ragnarok’ was handed to Taika Waititi, an offbeat indie director from New Zealand whose previous works include vampire mockumentary ‘What We Do In The Shadows’ and last year’s superb adventure comedy ‘Hunt for the Wilderpeople’. Moving from a budget of £2.5m to one of £180m and all the trials and tribulations that come with working for a major studio such as Marvel has already seen off several high profile indie directors, but Waititi’s brilliant brand of Kiwi comedy is a match made in heaven with ‘Ragnarok’s tone. It’s helped by the brilliant Chris Hemsworth, now comfortably the MVP of the MCU in my eyes, and he gets to show off his comedic talents to fine effect throughout ‘Ragnarok’. Much of the film takes place on an alien planet called Sakaar which feels both completely irrelevant to the main plot, yet also an immensely entertaining homage to the likes of ‘Flash Gordon’ with it’s bright colours, zany characters and Jeff Goldblum appearing as the games obsessed Grandmaster. This is all aided by a terrific soundtrack (‘Immigrant Song’ is always a pleasure to hear), a strong cast (Tessa Thompson is great as Valkyrie, as is Waititi’s extended cameo as ‘Korg’) and a light and breezy visual style. If there’s a criticism it’s that the stronger comedic focus removes a lot of the jeopardy from the movie and it does lead to the sidelining of popular characters such as Idris Elba’s Heimdall. That being said, I had a blast with ‘Thor: Ragnarok’ and would consider it one of the strongest Marvel films of recent times. I love Waititi’s work, whether it be on the tiniest budgets or now on the biggest, and here’s hoping this is as big a success to justify Marvel giving out more creative freedom with its cinematic universe in future.